Product prices and availability are accurate as of 2019-04-13 16:44:18 EDT and are subject to change. Any price and availability information displayed on http://www.amazon.com/ at the time of purchase will apply to the purchase of this product. This replacement TV stand is great for smaller displays. 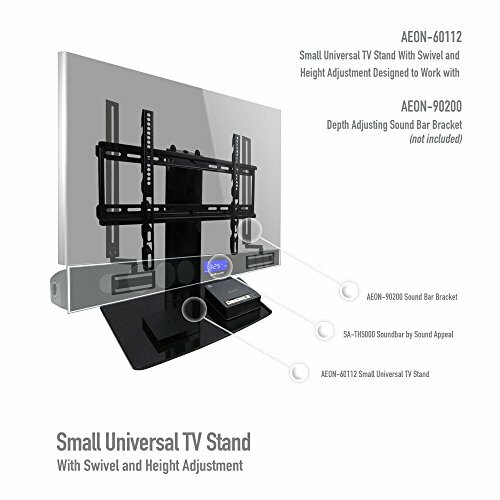 The Aeon 60112 swiveling Universal TV stand is ideal for flat panel displays 23-50". Works great as a replacement TV stand for Samsung TV stand, Vizio TV stand, Sony TV stand and many others. All while making the most of functionality. The black 8mm thick tempered safety glass base enhances the look and overall design. This swiveling TV mount adds a unique ability to swivel where others cannot. Now your TV can be directed up to 45 degrees in each direction towards the viewing area by pivoting the unit. No need to twist the base with it. This feature is usually available only on articulating TV mounts. This TV stand mounts the TV high enough to have a Sound Bar or video game sensor in front and not block the view or the infrared sensor on the TV. Most TV stands have the TV too low to do this. 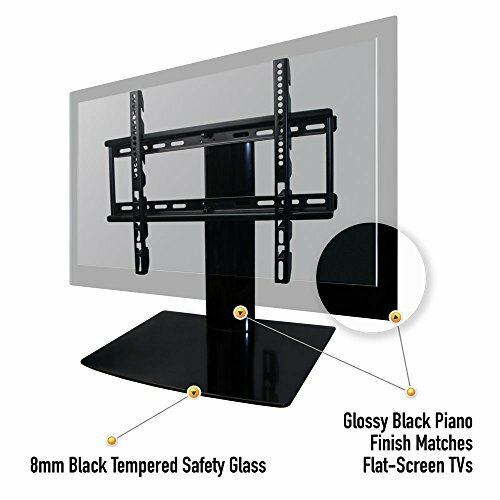 - Fits TV's 23-46" in size, even fits some smaller and large TV's but depends on VESA. Double check your VESA pattern to insure fit. - Fits TV's with a VESA pattern between 100x100mm up to 400x400mm. - Measures 20 inches high (not including TV) with the base measurement of 17.75"(w) x 12" (d). - This stand can hold a maximum of an 60 pound TV. - Swivels left and right up to 45 degrees in either direction. Small Universal TV stand for many applications. Affordable, adjustable TV stand for most makes and models, easily works as a Samsung TV stand, Vizio TV stand, Panasonic TV stand, Sony TV stand, and many more. 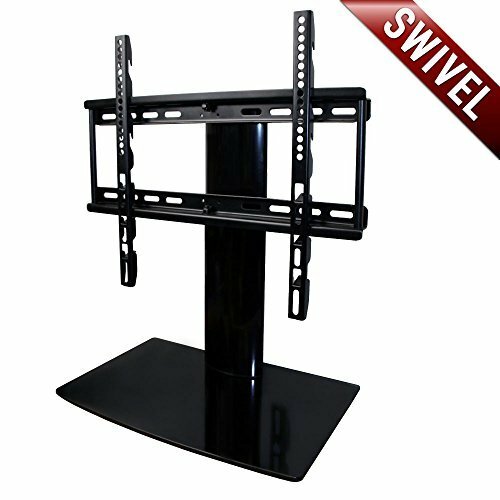 This TV swiveling TV stand creates a modern look for your audio video equipment. The black 8mm thick tempered safety glass base enhances the look and overall design. Adjustable! 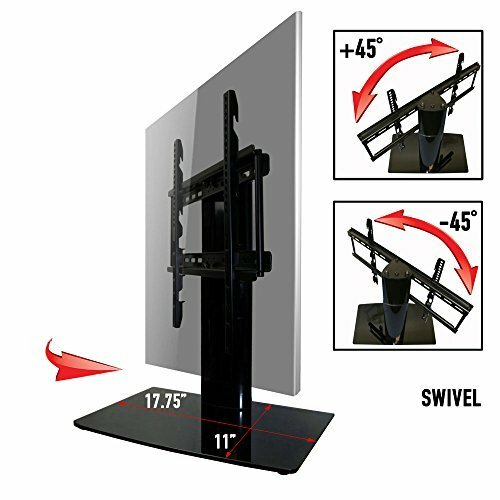 Swivels left or right so achieving the ideal viewing angle has never been easier. Also height adjustable so your TV can be adjusted to your application or allow room for a soundbar or component below. This way the IR sensor on your TV will never be blocked and your remote control will always function as it should. Replace your TV stand. This TV stand adds a unique ability to swivel where others cannot. Now your TV can be directed up to 45 degrees in each direction towards the viewing area by pivoting the unit. No need to twist the base with it. This feature is usually available only on articulating TV mounts. This TV stand measures 18.75 inches tall from bottom to top of column, not including TV height. The base is 17.75" wide and 12" deep. Max TV weight is 80 pounds. This unit weighs in at just 15 pounds. Will it fit? This TV Stand will fit most TVs from 23 to 50 inches in size and weighing up to 60 pounds. To make sure this mount will fit insure your TV's VESA bolt pattern falls between these two sizes : 100x100mm up to 400x400mm.